to our Grand Prize Winner! I love using Eggland's Best eggs in all of my baking and cooking; they simply taste better! And, as a Mom I feel good about using them because of the superior nutritional value, especially the bumped up Omega 3's and vitamins, which are important to us. I also appreciate the quality control at Eggland's. My inspiration for this recipe is the 1904 World's Fair in St. Louis, where the ice cream cone was introduced. I also use pecans, one of the most prevalent nuts grown in Missouri. Thank you to all of our fans who submitted their egg-cellent recipes and voted! NO PURCHASE NECESSARY TO ENTER OR WIN IN THE EGGLAND’S BEST 2018 “AMERICA’S BEST RECIPE” CONTEST. Open to legal residents of the 50 US, DC, PR & GUAM, 18 or older. Void where prohibited. Contest starts 02/13/18 and ends 12/04/18. Entry period starts 02/13/18 and ends 04/30/18. For Official Rules, which govern, click here. Sponsor: Eggland’s Best, LLC. © Copyright 2002 - Eggland's Best, LLC. All rights reserved. Enter your email address to vote. Check your email to confirm your vote. Yes, I would like to receive the monthly Eggland’s Best newsletter with delicious recipes. I just voted for my favorite original EB foodie photo! Go to egglandsbest.com/foodtography and vote to help decide who will be named the ultimate EB Foodtographer and take home $5,000! I just voted in the @EgglandsBest Foodtography Contest! 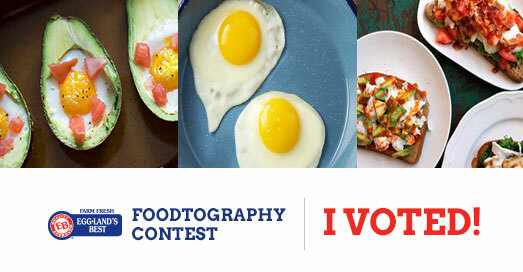 #EBFoodtography Vote now and help choose the $5K winner!